Raft Cove is great for both day trips and overnight camping. It features a long sandy beach, rocky headlands, old growth forest, and is a popular spot for surfing, fishing, hiking, and camping. The beach can be reached via a challenging 2 km hike (about 45 minutes) or by kayak along the Macjack River. 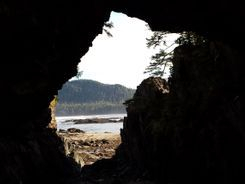 Located on the West coast of Northern Vancouver Island Raft Cove is approximately 1.5 hours from Port Hardy on unpaved logging roads. It is well worth the drive.